Attract and retain talent, win contracts, and stand out against competitors. Select reliable, high-quality suppliers for the long-term. Attract world-class employees and stimulate local economies. Reduce investment risk with deep insights into company quality. 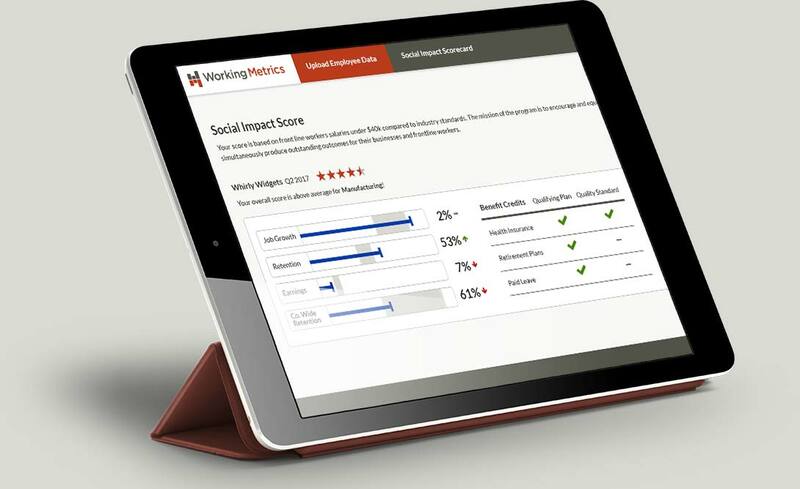 Working Metrics is a data analytics platform that lets you improve business decisions and results through deep insights into job quality and diversity. Evaluate compensation, benefits, and workforce inclusion trends. Generate company scorecards and comparisons instantly. Benchmark company metrics versus industry and regional peer groups. Drill down with department, regional, or cohort analytics. Share workforce metrics and analytics with third parties securely. Great Jobs Drive Exceptional Results. Working Metrics unlocks workforce analytics to improve employee job quality and business performance. We partnered with the Aspen Institute, to combine our technology vision with their global labor market expertise to drive good jobs and good business. Copyright © 2018 Working Metrics Corporation. All rights reserved.